Reportizer is a software tool to create database and file reports. With Reportizer, you can create professional reports in a couple of minutes! Reportizer reports can be edited in easy to use and powerful visual report designer with property inspector, tool bars, Drag and Drop interface, Undo/Redo functionality, and much more. For advanced users, there is an option to modify reports in text mode. 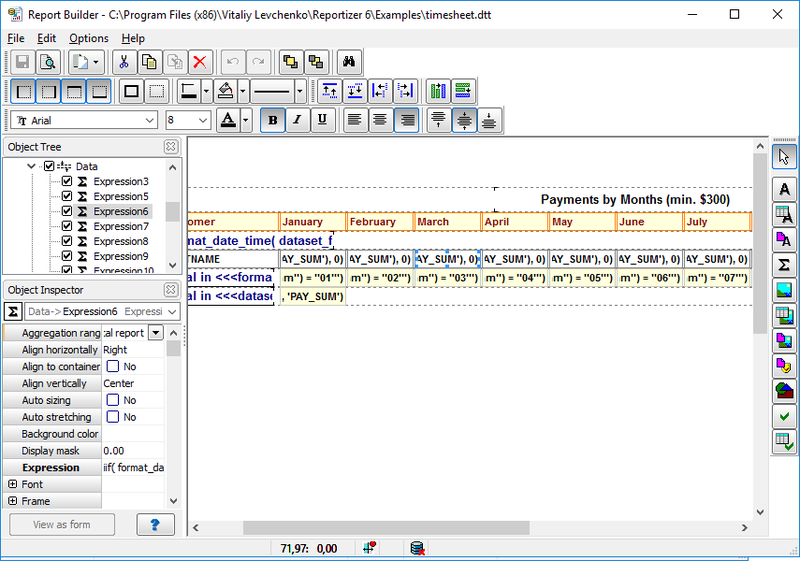 Database queries are written in convenient SQL editor with syntax highlighting and code completion. In the SQL code, all SQL features of your database are supported. You can use query parameters and macros which are applied dynamically in run time. 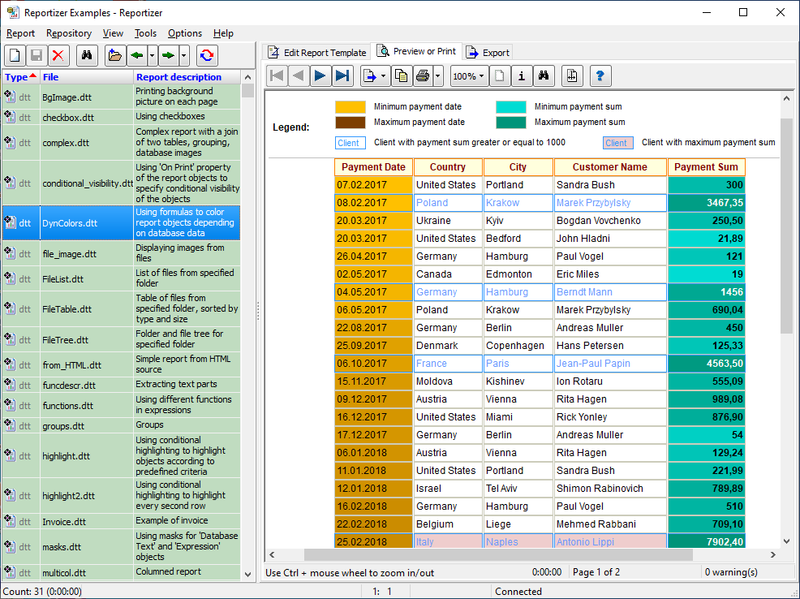 Report engine of Reportizer supports dynamically calculated expressions (formulas), displaying images, grouping records, multi-column reports, totals and subtotals etc. 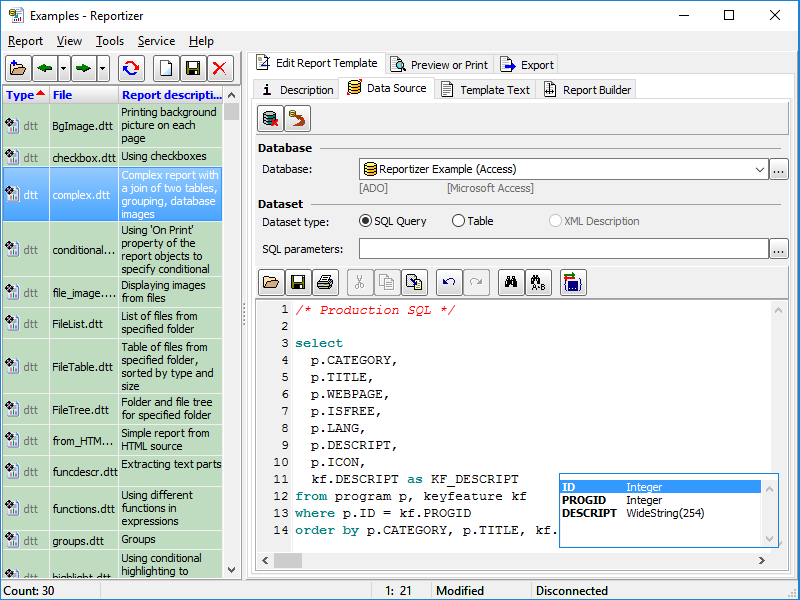 Reportizer is a universal reporting tool as it works with all major database types like ODBC, Oracle, PostgreSQL, Interbase, Firebird, SQL Server, MySQL, SQLite, Access, Excel, Visual FoxPro, dBase, Paradox, CSV, HTML etc. The report design is independent of database type. The database specific attributes of report are separated from the visual part of the report. For example, your Access report can be easily converted to SQL Server report if the database structures are compatible. 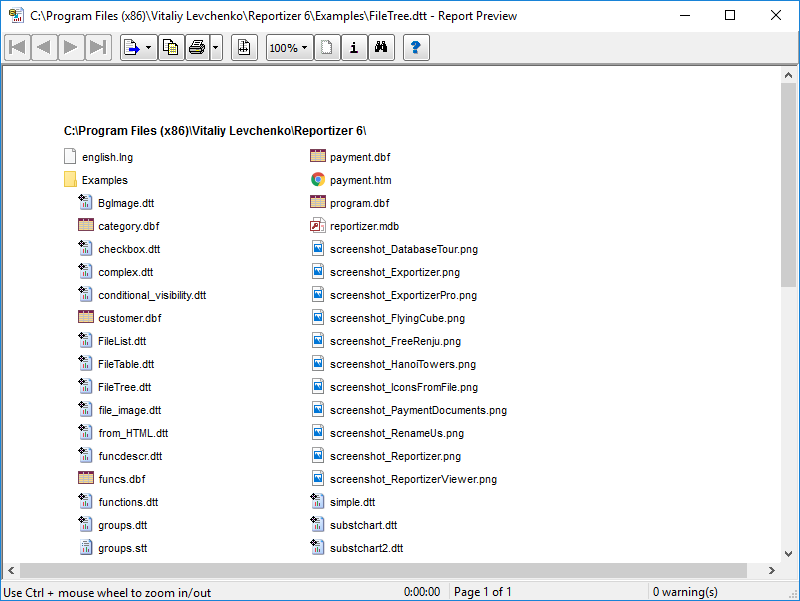 In addition to database reports, Reportizer can build and print file reports. In file report, Reportizer uses Windows file system as a database, where folders are tables, and their subfolders and files represent table records. The folder and file attributes can be interpreted as table fields. Using such a feature, you can print list of files from specified folder(s) (with their icons, dates etc. ), file contents and more. There is an ability to load and print reports from command line with a large set of options. Reports can be exported to HTML, Excel (XLSX), text, PNG, JPEG, GIF, bitmap (BMP) formats. There is an ability to save report in Reportizer internal format: static report (STT). Static report contains an exact copy of the generated report and does not require the database connection to show the report, therefore it is useful for exchanging reports with colleagues, clients etc. There is a small read-only utility Reportizer Viewer, which can be used on the client side. The reports can be stored either in files or in database tables. You can register such storages in the program with friendly names and easily switch between them. Copyright (C) 2019 Vitaliy Levchenko Software. All rights reserved.